To realise the full benefits of a consolidated, company-wide Cloud Communications architecture, the right preparation is vital. Our 3-stage approach is designed to ensure you transition successfully. Audit current situation You need to identify and fully understand your current assets, capabilities and processes by comprehensively auditing your communications and collaboration environment. Identify improvement opportunities Different cloud solutions offer a wide variety of tools and features for improving working practices, so you need to identify which of your processes could be improved to make your business run more efficiently. Prepare your business Your staff, partners, suppliers and customers all need to be fully prepared for whatever impacts your implementation will have on them. You should also review whether any of your technology needs to be refreshed (such as broadband links and handsets). A good cloud services provider will work with you through these preparatory stages to ensure that your new solution is the right match for your business and improves on current working practices. 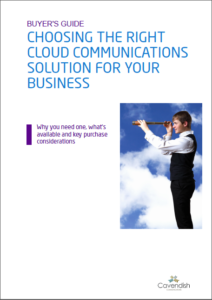 To download our Buyer’s Guide: Choosing the right Cloud Communications Solution for your business, please complete the form below. If you would like to know more about our Cloud Telephony Services, please call us on 0800 206 2107 or email us.